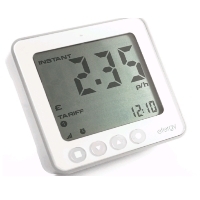 The e2 is the latest development in wireless electricity monitors. It provides all of the features and benefits of our elite model and also allows you to download your energy consumption data to your PC. This makes it very easy to track your energy usage and the impact of the changes you make on your consumption and electricity bill. The memory function stores your energy data so you can view it by day, week or month or as an average. You can even view hourly data over the previous 8 months. The e2 also tracks your CO2 emissions, calculating the carbon footprint generated by your electricity usage. All of this easily accessible information will help you to determine how best to reduce your energy use so you can start saving energy and money straight away. Transmission Time: 6s. 12s. or 18s. Battery powered wireless display unit. What is a 2 split core vs 3 split core? The units with 2 split core is for single phase, such as homes and some small business. The 3 split core is for 3 phase, which is for commercial and some very large homes. It applies to the E2 Classic and the Elite Classic.